Extra Simply Means Creating Your Own Future. Extra Is What Makes The Difference In Life. There Is No Much Different Between 100 And 101, But If 101 Is The Cut Off For Living Those With 100 Will Die. Think Extra And Live Life. Extra Is Just The Little You Can Do More Or Better Than Others. Anything Without Extra Will Soon Lose Value. 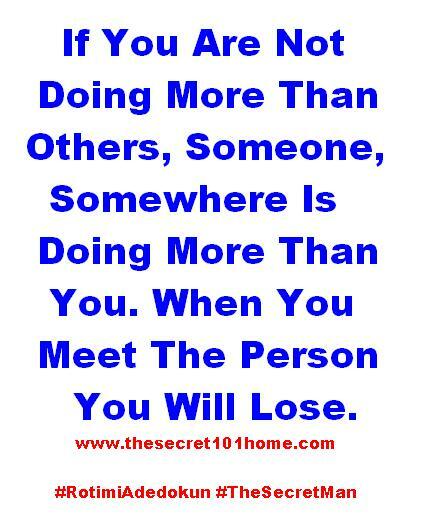 If You Are Not Doing More Than Others, Someone Somewhere Is Doing More Than You. When You Meet The Person You Will Lose. This entry was posted in Self Development, Spirituality, The Secret, Vitamin Of The Mind, You! and tagged Above And Beyond, Bishop David Oyedepo, Extra Hours, Going Beyong Yourself, Jim Rohn, Pastor E A Adeboye, Rotimi Adedokun, Sacrifice The Key To Living Life. Bookmark the permalink.